When you find the word Trumpet or Trump, in the Bible, the Hebrew word is Shofar. The blessings of God are many, and unfortunately many have been taken from the Church. Not only have the Holidays of God been replaced with pagan ones, but many of the joys of worship and praise as well. For those who discover these truths find great joy. I believe the Shofar is one such joy and expression of love and obedience to God and His Word that has been taken from us. God Himself blew the Shofar when Moses was on Mt. Sinai Ex. 19:16, and the voice of the Shofar exceeding loud; so that all the people that was in the camp trembled. God will blow it Himself again at the coming of the Messiah, I-Thessalonians. 4:16, For the Lord himself shall descend from heaven with a shout, with a trump (Shofar) of God: and the dead in Christ shall rise first. We also find in Zechariah 9:14 And the Lord shall be seen over them, and his arrow shall go forth as the lightning: and the Lord God shall blow the Shofar and shall go with whirlwinds of the south. There is something about the blowing of the Shofar that has the ability to awaken the inner man, the door opens for the Holy Spirit to enter in. It provokes prayer like nothing else can. · Psalm 98:6, God tells us it is to be used to call us to worship, and to praise Him for His salvation. · Psalm 150:3, God said to praise Him with the Shofar. · I-Chronicles 29:26-28, God says to use it as a call to worship. · Josh 6:4 –20, The Wall of Jericho came down when they blew the Shofars. So we find in the Word, not only has God given us reason to blow the Shofar but He has set the example by blowing it for us on occasions and promises in I-Corinthians 15:52 In a moment, in the twinkling of an eye, at the last Shofar: for the Shofar shall sound, and the dead shall be raised incorruptible, and we shall be changed. This is just something you may find interesting, there are many similarities between a Christian and a Shofar. 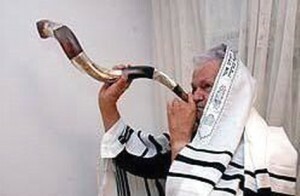 Certain Rabbis are specially trained to make the Shofar, for it to be Kosher. He begin with a rough Rams Horn, it isn’t much to look at, at this point, but he begins by using a special Anointing Oil to start rubbing and working with it. We are not much to look at either when God first gets us. By One Spirit are we all baptized into one Body, whether we are Jew or Gentile. The Holy Spirit, the Anointing Oil of God begins to do a work in our lives. As the Rabbi works with this rough Rams Horn, it begins to smooth it out, and before long he begins to see himself in the reflection. You see, it takes a lot of work for most of us to begin reflecting the image of God in our lives, but the Masters hand keeps working with us until He too can see Himself in His handy work. Once the Rabbi sees the outside begins to look good, he then begin to pull out the flesh from inside the Horn, with loving care he reaches deep inside the horn and pulls out the old flesh until only what he wants there is left. Before God can use any of us, He first requires the flesh to be laid at the Alter, and God too begins to tear the flesh away, and replaces it with His Spirit, and His love. Then the Rabbi sees that his work is good, and decides to make a mouth peace that he may blow his breath through it, and out will come a sound that will call God’s people to prayer and worship. A sound so mighty that the enemy will flee from it. That walls will be torn down and mighty works will be done in God’s Name. So, like the Shofar, God will begin to speak through His children once they have surrendered over to Him. He will pour out His Spirit the His Ruach Ha Kodesh (The Breath of God) and it will come forth with power and men will be saved and Yeshua will be lifted up high for all to see. I must tell you that I felt the anointing of God while writing this and learned things from God while in the process. Hope you enjoy reading it as much as I did writing it.